Details: Free to all attendees. Join us as we step you through a fun Sewing Project. No machines needed, lecture/demo only. Please bring show-and-tell to share, we can all inspire each other! 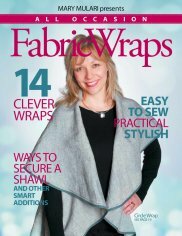 For November Sew Club we will be staying warm with a beautiful fabric wrap from the oh-so-creative and inspiring Fabric Wraps book by Mary Mulari!